This is a tradition that is seemingly outdated since doors with pops of color are very popular this year. Initially painting your front door red was a way to showcase that your family had paid off the mortgage and was debt free! Did you know that bubble wrap was not initially created to be a packaging agent but as a textured wallpaper? Can you imagine having this on your walls? In house with children this could be both interesting, noisy and a way to keep your walls safe. This was a flop as wallpaper but great for packaging and protecting items in transit. These days this term implies a fun party to show off your new home to friends and family but this party name is actually a literal term back in the day. Before central HVAC’s were a thing, a housewarming was when neighbors came over bearing firewood to place and light in all of the fireplaces throughout the home. This tradition warmed the home as well as warded off evil spirits as it’s believed that unoccupied homes attracted random ghosts. 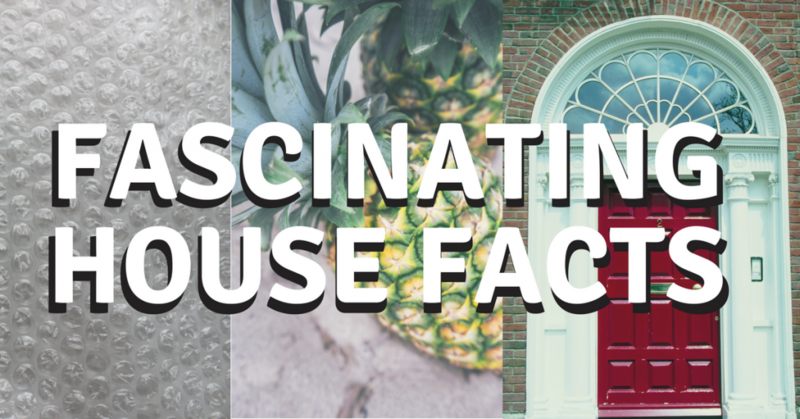 Putting pineapples on the outside of your home comes from around the 15th century and symbolizes hospitality or welcoming to visitors or someone who is passing by. As time went on it grew to mean more than just hospitality, it also symbolized wealth and status of a family. Pineapples back then were very expensive and having the money to afford a pineapple in that time was a very big deal. People would pay to host a pineapple, not even eat it, at their home in the 16th century, can you imagine not eating it? Headboard was created as a way to keep sleepers warmer in their beds at night, it severed as a barrier from cold drafts that may come through a home before central HVAC and good insulation were around. According to Wikipedia, They were created with wood since wood is less conductive than other substances and wouldn’t transfer cold to the bed or sleeper. Today, headboards are no longer used for warmth but for a decor piece in a bedroom.